Every once in a while, I run across a book I can’t decide if I enjoyed or not. When this happens, this indecision is because I ask myself this question – “If I didn’t enjoy it, what are the reasons?” The answer to this question has rarely been the same for any two books. However, the process for finding a satisfactory answer is always the same. 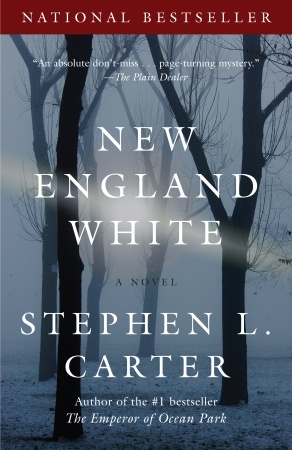 I have been putting off a review for New England White by Stephen Carter for several weeks now, as I tried to figure out what my thoughts on this book were. The author kept my attention for the first half of the book. At some point, right around the middle, some pretty strange twists started occurring. I wasn’t really sure whether they were necessary to the conclusion of the main plot or not, or why the author felt it was necessary to try developing them into the main plot. I have to be honest, I did not mind finishing the book, because it was well-written enough to lead me to believe it would all come together and the obscure twists would be extremely relevant in the end. When I got to the end, I felt the book was too long and could have done without all the wierd involvement of the townspeople and all the sub-plots. The only character that showed any real growth was Julia (the main character). That said, I’m not really sure I knew anything more about her at the end than I did at the beginning. It was very clear early on, she played the role of the University President wife, but she also didn’t get her position in the university by being completely subservient. I thought the author did her particular character a great injustice by making her so intimately involved with the murder victim in the past. This particular twist did nothing to enhance my understanding of any of the characters in the book. None of the other characters did anything for me in the least. I didn’t hate Julie’s husband, though I suspect I was supposed to. I didn’t think much of the interesting talents of her daughter, though I suspect I should have been amazed at her ability to ‘just know things’. Truth be told, I really did not care about any of the characters. I am pretty sure this has nothing to do with the race of the characters, because as I state below, I forgot what their race was through most of the story. A large part of the plot had to do with the African American community and its prominent elite membership. During some parts of New England White, I completely forgot the main characters were African American. It seemed important to the author to remind his readers this book was about African Americans. The insight was interesting, but I didn’t feel like specifying and reminding the reader about the race of the characters was really that important. The story could have been good with characters of any race. The title could have been New England Black and it still would have been interesting enough to catch my attention. I felt like the sub-plots added way too many pages to the book. Except for the significance of the race of original victim and her murderers, the idea of African Americans living in a small white New England town really just didn’t create all that much significance to the story in my mind. I may have missed the boat on this one, but there were just too many irrelevant characters and plot twists for my liking. This truly bothers me though, because I enjoyed the writing and language used. I encourage others to read New England White and come up with their own opinions.